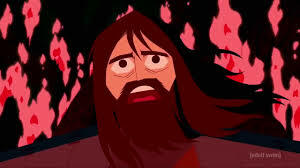 It has been 13 years in our time since Samurai Jack was on the air, but 50 years have passed in Jack's world. It seems appropriate then, that our valiant time traveler should pop back to finish in detail what he began - the destruction of the (all together now) "Shapeshifting Master of Darkness" Aku. The long-touted 10-episode return of this sci-fi animated series occurred last Saturday, March 11, on Cartoon Network's Adult Swim. In episode 1 of Season 5, Jack roars back onto the screen, but isn't one bit triumphant. Gone is the simple white gi and magical sword. Gone is the smoothed back bun. Here, we have a wild man on a motorbike looking like he freshly drove off the set of Mad Max: Fury Road. With a full beard and long black hair left to blow untethered in the wind, we get the sense our classically unruffled hero has finally HAD it with Aku and hacking around in the future. Phil LaMarr returns as Jack's stoical voice, and the episode opens with him saying in a strangled, breathless tone, "Gotta get back...back to the past." What was once a witty phrase for a fun theme song now sounds like a desperate mantra to maintain sanity. Even Aku as a bodily presence has vanished, and his loyal cult followers are in a veritable fervor for his great return. For now, he is merely a voice on the phone ( by Greg Baldwin, a successful recast from the original Japanese actor, Mako, who passed away in 2006). Even the wise-cracking, beboppin' robot Scaramouche, (show veteran Tom Kenny) wielding a sword that doubles as a tuning fork (!) can't dull the dark edge of this new season. Even the comforting familiarity of "the bad old days" are gone. All is NOT as it should be. Although the show ran for four seasons, it vanished as suddenly as it arrived. The show's wrap-up felt peremptory. 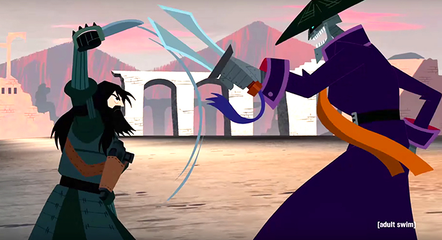 Tartakovsky mentioned in a recent interview for NPR that he was "burned out" by the studio's creative differences at the time and other projects competing for his attention, so instead of struggling onward, decided to end the show in the most graceful way he could. But it was pretty clear there was still more to tell - and the show's fan base has agreed. While the show has classically tested Jack's psyche, it is clear from this first episode that this encore final season is going to show us exactly what Jack has been put through mentally as a result of Aku and - hopefully - how he will intend to rise above it. Being on Adult Swim - which was just a fledgling concept in the series' heyday - has allowed the show to go into darker territory, which by doing so realizes its full potential rather than veering onto a radically different path. Despite our time-worn hero, Samurai Jack hasn't skipped a beat - it's just finally been allowed to become the grown-up show we always knew it could be. For a limited time, you can stream the season as it airs here.